U.S. workers’ wages have climbed modestly but noticeably over the past year. EPI’s nominal wage tracker shows that in 2015 and 2016, this growth averaged 2.4 percent, in 2017 it averaged 2.5 percent, but in 2018 it accelerated to 2.85 percent—and it surpassed 3 percent growth in the last quarter of the year. This uptick has been long-coming and it took a longer spell of low unemployment to spur it than most would have thought. Three percent growth for a quarter, however, should not constitute “mission accomplished” in the minds of macroeconomic policymakers like the Federal Reserve. In the long run, nominal wage growth should run at a rate equal to the Fed’s inflation target (2 percent) plus the long-trend growth in potential productivity (let’s call this 1.5 percent).1 This indicates that even the recent accelerations in wage growth leave us failing to meet these long-run goals. Even more importantly, wage growth should run substantially above these long-run targets for a spell of time after long periods of labor market slack. The arithmetic reasoning for this is straightforward: any time wage growth runs slower than current rates of inflation plus productivity, the result will be labor compensation shrinking as a share of the economy. The economic intuition is simply that extended periods of labor market slack sap workers’ ability to secure wage increases from employers. This undermining of labor’s leverage shows up clearly in the data. EPI’s nominal wage tracker, besides charting wage growth over time, also tracks a measure of labor’s share of income, precisely to highlight the accumulated shortfall of labor income that policymakers should aim to restore. Note: Shaded areas denote recessions. Federal Reserve banks' corporate profits were netted out in the calculation of labor share. We think tracking labor’s share of income is crucial for policymakers, and that this figure contains lots of interesting insights about macroeconomic dynamics. Before we delve into these insights, however, we should first note that our measure above is not the only way to measure labor’s share of income. In particular, a measure obtained directly from the Bureau of Labor Statistics (BLS) productivity series is often referenced. 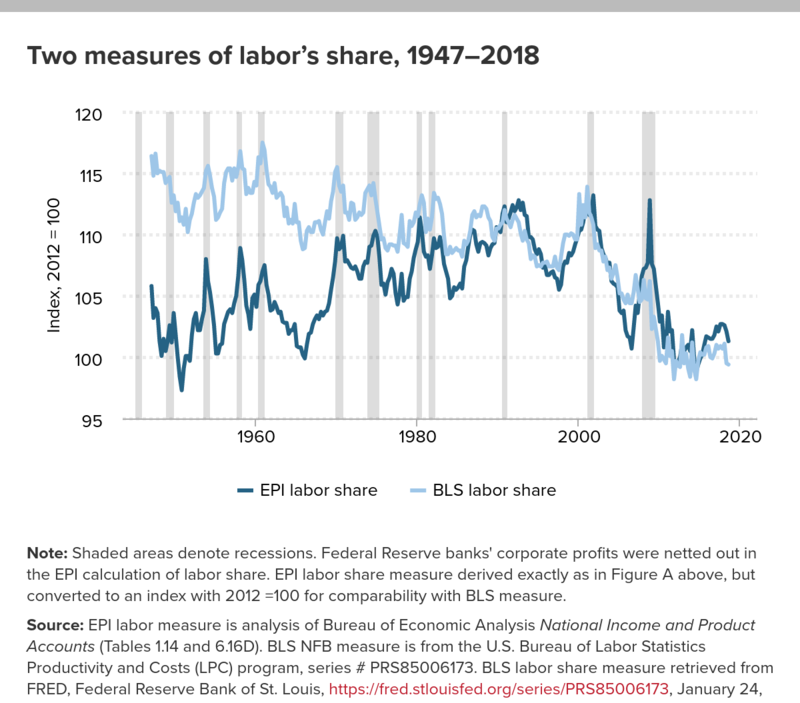 This measure—reproduced below and shown side-by-side with our preferred measure—shows some non-trivial differences in the labor share over time. Most strikingly, the BLS measure has a much stronger long-run downward trend than the measure we use. Note: Shaded areas denote recessions. Federal Reserve banks' corporate profits were netted out in the EPI calculation of labor share. EPI labor share measure derived exactly as in Figure A above, but converted to an index with 2012 =100 for comparability with BLS measure. Source: EPI labor measure is analysis of Bureau of Economic Analysis National Income and Product Accounts (Tables 1.14 and 6.16D). BLS NFB measure is from the U.S. Bureau of Labor Statistics Productivity and Costs (LPC) program, series # PRS85006173. BLS labor share measure retrieved from FRED, Federal Reserve Bank of St. Louis, https://fred.stlouisfed.org/series/PRS85006173, January 24, 2019. What explains these differences? Three things: First, our measure examines labor’s share in the corporate sector only, while the labor share from the BLS productivity series looks at the broader non-farm business (NFB) sector. Second, our measure uses net, not gross, measures of income. So, our measure strips out depreciation from the income in the denominator of the labor share. Third, our measure strips out the profits of Federal Reserve banks. We think each of these decisions yields a better measure if you want a labor share indicator that sheds light on the relative bargaining strength of workers vis-a-vis employers—below we explain why. First, we focus on the corporate sector rather than the total economy or even the NFB sector. We make this choice because in the corporate sector all income is either labor income or capital income. Since we are interested in using changes in the labor share as measures of relative bargaining strength between workers and employers, this clean distinction between incomes is useful. In the total economy, there are many income flows that do not necessarily tell us much about this relative bargaining strength. Rental incomes accruing to property-owners, for example, can come at the expense of both workers and their employers, and can in theory reflect land scarcity rather than anything profound about the current state of macroeconomic slack. Proprietor’s incomes are a mix of labor and capital incomes, and correctly apportioning which share of these should be chalked up to returns to labor versus capital is near-impossible. The corporate sector divides income cleanly into labor versus capital, and yet remains large enough (accounting for over 70 percent of the U.S. private sector) to provide generalizable findings. Second, we focus on net measures of income that account for depreciation. Depreciation is the reduction in the value of assets that occurs through wear and tear or technological obsolescence. If income from current production is not used to reinvest and keep the value of the capital stock whole in the face of constant depreciation, this would lead to a smaller capital stock and reduced productivity over time. Hence, depreciation represents a claim on income that cannot boost the living standards of either workers or capital owners. Further, the share of depreciation in corporate sector value-added (as well as its share in total economy gross domestic product) has been rising steadily over time. The reason for this rise is well understood: information and communications technology equipment has been steadily rising as a share of the overall capital stock, and this type of capital depreciates far more rapidly than other types (think of how often you need to replace your laptop or cellphone these days). This steady rise in depreciation is a significant reason why the decline in the labor share shown in the BLS NFB measures is larger than in our measure. Yet the decline in the labor share that’s due to the rise of depreciation really doesn’t tell us much about labor market dynamics or macroeconomic slack. Finally, we choose to strip out the profits of Federal Reserve banks for our measure.2 In the course of their open market operations (buying and selling bonds to move interest rates), the Fed makes profits. These profits are used to finance the Fed’s operations and they remit anything left over to the U.S. Treasury. These profits have very little to do with underlying labor market dynamics or macroeconomic slack. Before 2008, because these profits were generally quite small and relatively stable as a share of corporate sector value-added, they could largely be ignored in examinations of the labor or profit share. Post-2008, however, the Federal Reserve vastly expanded the scale of assets it purchased as part of its effort to hold down long-term interest rates (an effort commonly referred to as “quantitative easing”). This larger balance sheet led to significantly larger Federal Reserve profits during the recovery from the Great Recession. All else equal, this would have led to a further decline in the measured labor share of income. But since these Federal Reserve profits were not the result of increased leverage vis-a-vis workers over implicit wage bargaining, it doesn’t make much sense to allow them to depress the labor share measures we’re examining for evidence about this relative bargaining strength. In recent years, the Federal Reserve profits have been declining as their balance sheet has shrunk modestly. This would, all else equal, boost the labor share of income, but this boost would not represent increased leverage by workers. Given these considerations, our measure of corporate sector income and profits removes the profits earned by Federal Reserve banks. This again leads to a smaller decline in the labor share when compared to the BLS measures over the whole post-Great Recession period. Assume for the moment that our way of tracking the labor share is better for assessing underlying labor market dynamics and the state of macroeconomic slack. This measure contains a number of interesting findings. 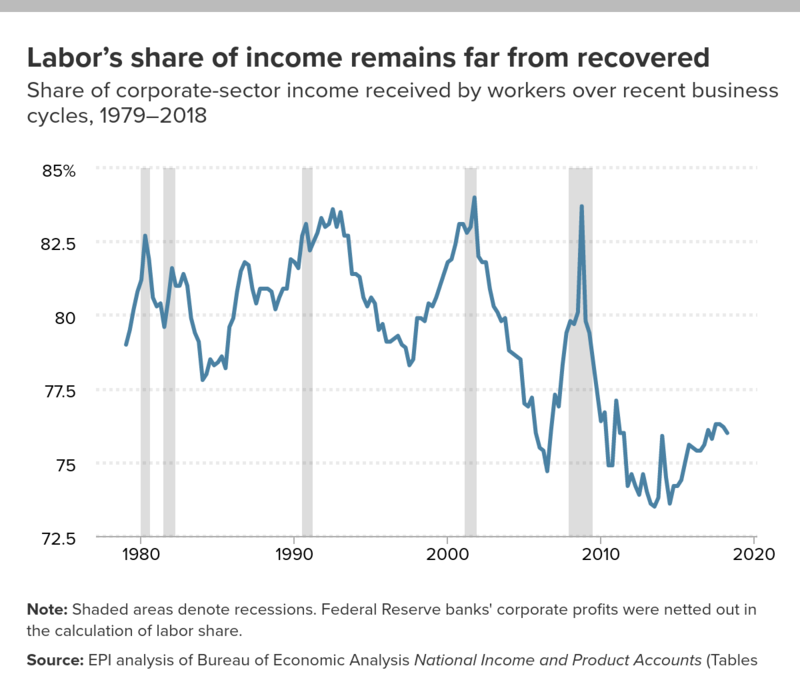 One finding, which most might find counterintuitive, is that during recessions (the shaded areas on the chart) the labor share actually tends to rise. This mostly tells us that corporate profits are very cyclical, and fall even faster during recessions than labor income.3 But once the official recession is over, these profits tend to recover much faster than labor income and this leads to a rapid decline in labor’s share in the early phases of business cycle recoveries. As recoveries mature and turn into expansions, the reduction in labor market slack eventually allows the labor share to begin making up some of its early-recovery losses. Another striking feature of our measure of the labor share is how depressed it remains even as we approach 10 years from the end of the Great Recession. This highlights that even wage growth significantly faster than we’ve seen in recent months can persist for a long time before it necessarily translates into inflation breaching the Fed’s 2 percent target. If inflation-adjusted wages start rising faster than economy-wide productivity, this does not necessarily lead to an inflationary wage-price spiral; instead some of this faster wage growth can be absorbed by firms in coming years through a slight reduction in their still quite-fat profit margins. In an earlier paper, we calculated for how long nominal wage growth could outpace the sum of inflation and productivity growth before previous labor share peaks were broached.4 The figure below reproduces these calculations, using the Fed’s 2 percent inflation target and productivity growth averages since the beginning of 2017 (1.1 percent), and various scenarios for nominal wage growth. 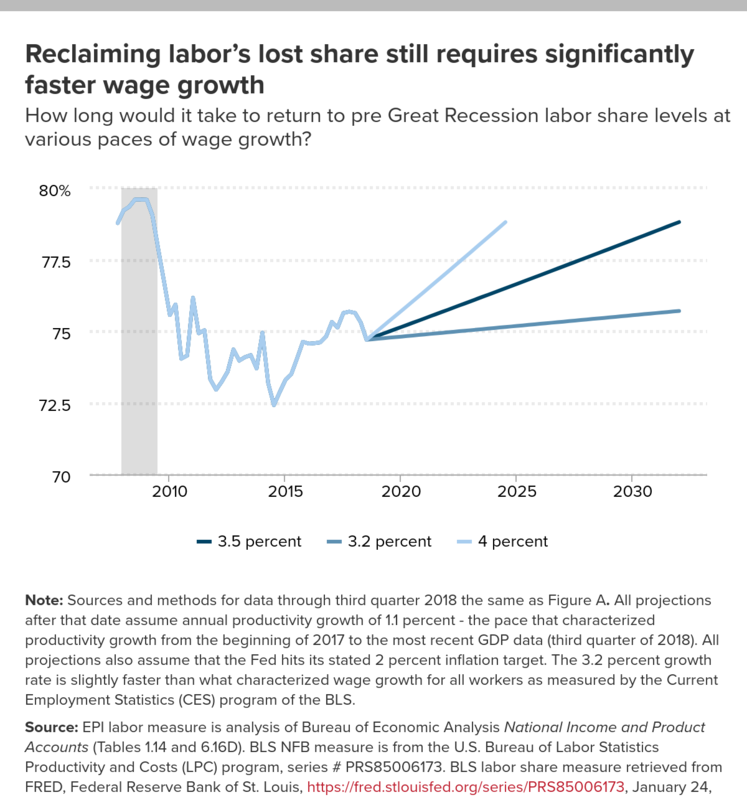 Reclaiming labor’s lost share still requires significantly faster wage growth: How long would it take to return to pre Great Recession labor share levels at various paces of wage growth? Note: Sources and methods for data through third quarter 2018 the same as Figure A. All projections after that date assume annual productivity growth of 1.1 percent - the pace that characterized productivity growth from the beginning of 2017 to the most recent GDP data (third quarter of 2018). All projections also assume that the Fed hits its stated 2 percent inflation target. The 3.2 percent growth rate is slightly faster than what characterized wage growth for all workers as measured by the Current Employment Statistics (CES) program of the BLS. Is it possible that structural changes, not just prolonged labor market slack, have contributed to the fall in the labor share and macroeconomic reflation alone won’t be able to claw back this post Great Recession decline? It’s possible—and the most-sensible theory for what precise structural change might have led to this is a rise in monopoly power. Empirical research clearly shows upticks in industry concentration ratios, and a number of large and crucial economic sectors (health care and finance, in particular) are characterized by immense pricing power. Other sectors (mostly technology) have also seen waves of consolidation that have not led (yet?) to rapid price growth, but have raised a whole host of concerns about the intersection of economic and political power. And yet the first priority in setting the conditions for better wage growth remains pushing down the unemployment rate and wringing out any last sign of slack from the labor market. In fact, our examination of labor share indicates that we can’t even diagnose the extent of the monopoly problem’s effect on wages and incomes until we wring out this labor market slack and spark some wage-driven price inflation. Consider the recovery following the recession in the early 1990s. Between the third quarters of 1990 and 1997, labor’s share of income in the corporate sector fell by almost 5 percentage points. This a big change—a change like that today would translate into about $600 billion being claimed by capital-owners rather than workers. So, this fall in labor’s share was large, but it was also quite persistent; seven years is a long time to see the labor share not recover from a recession-induced fall. Because most economists in 1997 thought the economy was clearly at full employment even as sluggish wage growth kept labor share flat, new theories were pushed forward (just like today) about how sluggish wage growth must be being driven by something else besides labor market slack. Skill-biased technological change was the fashionable explanation at the time. But, three years later, in the third quarter of 2000, labor share was just 0.3 percentage points below its 1990 peak and wages had risen sharply across-the-board. What changed in those three years between 1997 and 2000? Unemployment continued to fall and the share of employed adults (and prime-age adults) continued to rise, tightening up labor markets. The real innovation of this period was a Fed that did not preemptively raise interest rates to choke off falling unemployment; instead they waited for actual wage-driven price inflation to appear in the data. When it didn’t, they let the recovery continue. Today’s Fed should follow this advice and assume that the U.S. economy can restore the labor share of income lost during the recovery from the Great Recession; at least until the data tells us that it cannot by showing a large jump in inflation before this share is restored. 1. See Bivens (2015) and Bivens (2017) on the rationale for this nominal wage target and for evidence that recent years’ productivity malaise should not lead to large downward revisions in estimates of the economy’s potential productivity growth rate. 2. We call these “profits” of Federal Reserve banks because that’s what the Bureau of Economic Analysis (BEA) labels them in the data. Given that the Federal Reserve system is not a private business, it’s a bit of a strange label for lots of reasons, but we’ll follow the convention here. 3. This recession-induced rise in the labor share is most striking in the last half of 2008, as the write-off of the value of bad loans in the financial sector was reflected in large, one-time declines in corporate profits, sending labor’s share soaring for these quarters.